Oh I am getting frustrated, my internet connection is in and out like a fiddler's elbow at the moment and trying to get into blogland is so difficult. Been going on for ages too, I was supposed to get a call from the complaints department yesterday or the day before, they must be inundated cos they haven't contacted me yet!!!!! Perhaps that's another complaint to make lol. Anyhow, onto even more important stuff. 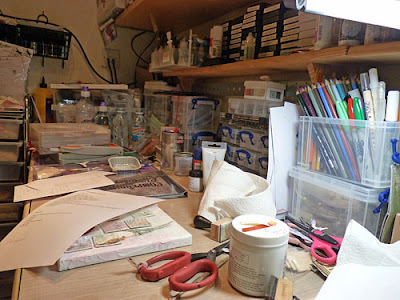 Here is my desk (photo taken last night) and as you can see it's a total mess this week. I seem to have about 5 projects on the go and inbetween I made a tag and posted yesterday just cos I wanted to. You can see a canvas I am working on on the foreground and that's my next workshop later this month. My Compendium of Curiosities and tools and equipment that all needs tidying away so I can get a space to carry on. So dear Julia and WOYWWers what do you make of this lot then? If you are interested in taking a trip around the world to see lots of crafty workspaces, pop on over to the Stamping Ground and take a peek at Julia's space and then link yours up too. Go travelling and see what fun you have. Your desk looks busy and I knowthe projects will be wonderfuL!! Good luck getting the Internet sorted!!! !have a great and creative week! Hugs trace. Oh Brenda pity about your net it is so frustrating isn't it? I have had probs in the past and it just annoys me esp when they don't get it fixed! Your mess on your desk is not so bad (haha) I know what it can be by myself. I look forward to see your canvas. Your desk looks like a creative process in the works! At least your desk can be seen! Hope you get the Internet service worked out soon! Not good! How is Becca doing? Have a great Wednesday! Hugs! It's so frustrating when people don't get back to you about stuff isn't it. I hope you get your internet problems sorted out eventually. It's so interesting to see where everyone works. You have such interesting things on your desk, Brenda. I like the look of that canvas peeping out. I love working on canvas but not done one for years. Great shot of the workdesk - oblique angles are clearly the in thing this week! - looks productively creative to me, rather than messy!! Canvas looks fascinating... thanks so much for stopping by, Brenda, and happy WOYWW! Loads of crafty playfulness, bliss, enjoy creating what looks to be great things. Lovely creative chaos!! I always work on 5 projects at a time too!! Internet problems are MADDENING, but Brenda, your desk looks great to me! Thank you for woyww visiting me this week! The internet can be such a pain at times, hope it is working better for you now. Looks like lots of fun things happening. Interesting to see what you do with the canvas. The internet is great - when it works! Your desk looks great. A great desk with lots of lovely RUBs on, I see! No chaos, just floating creativity! Looks way tireder than mine Brenda, just no time to clean these days. hope your computer woes clear up soon. I'd say that you look plenty busy! Thanks for stopping by my blog - in a much more timely manner than I managed to this week. Love the tag on your last post (had to go peek since you dropped the hint! ).